Оригинальный слоган Theyre packed and ready for the greatest adventure of their lives. All they have to do is get out of the house. 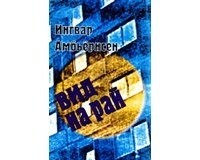 Ингвар Амбьернсен «Вид на рай», Импэто, 2001 г.